When someone asks me where I go to school, I proudly say “Barnard,” shortly followed by, “I’m a transfer, though.” Every transfer student can tell you about the overt challenges of adjusting to a new college: different and often greater academic expectations, feeling overlooked by the bureaucracy of the administration, and swallowing your social anxiety because you don’t have the option of being shy. These hurdles are certainly pertinent everywhere, but transferring to the Barnard-Columbia community has its own particular set of obstacles. Trying to matriculate into Barnard made me feel like a limp dishrag that was rung from both ends. I left Penn State and enrolled at Barnard in the spring of 2017 because I dreamt of attending a school that would allow me to operate as a young adult in New York, while simultaneously immersing myself in a world of academically rigorous students. I came from a place that valued uniformity, solidarity, and sticking to the status quo. The pressure to conform to social ideals in order to be “successful” at my old school made me feel as though I was trapped in a drunken dystopian novel. The expectation was to black out at least four nights a week or be deemed a loser. This was in part because the school was located in the middle of miles of rolling farmland, and there was simply not much else to do. Although this lifestyle took a toll on my schoolwork and both my mental and physical health, I felt as if there was no other option than to comply. Veering from the social norm would ostracize me from my community, but trying to be someone I wasn’t made me feel more alone than I had in my life. In my third semester, I began to be honest with myself about my college experience. I no longer wanted to numb the monotony of life in rural Pennsylvania with drugs and alcohol. I yearned to attend a school that prioritized learning, with peers who challenged me to think deeply and question the world. I desired to be in a place teeming with culture and void of excessive social expectations. I spent long runs fantasizing about wandering through museums and people watching in stylish city coffee shops on the weekends. When I arrived at Barnard three months later I quickly realized I had gotten exactly what I wished for. The lifestyle at Barnard and Columbia values independence above all else. I was free—free to do what I wanted, say what I wanted and dress as I wanted. The only hitch was how this individualistic culture would affect my ability to meet people, join the community, and really feel like I was a part of the school. As a spring transfer there were no student groups to join, no club fairs to attend, and certainly no overall feeling of starting anew amongst the student body. Students were reentering Morningside Heights in the thick of January and seasonal affective disorder was alive and well. I was lucky that I was placed in a double with my angel of a roommate, but many of my transfer friends got thrust into singles in dorms full of strangers who had no intention of reaching out to “the new girl.” In the initial transition I spent a lot of time alone. I often ate alone, studied alone, and explored the city alone. 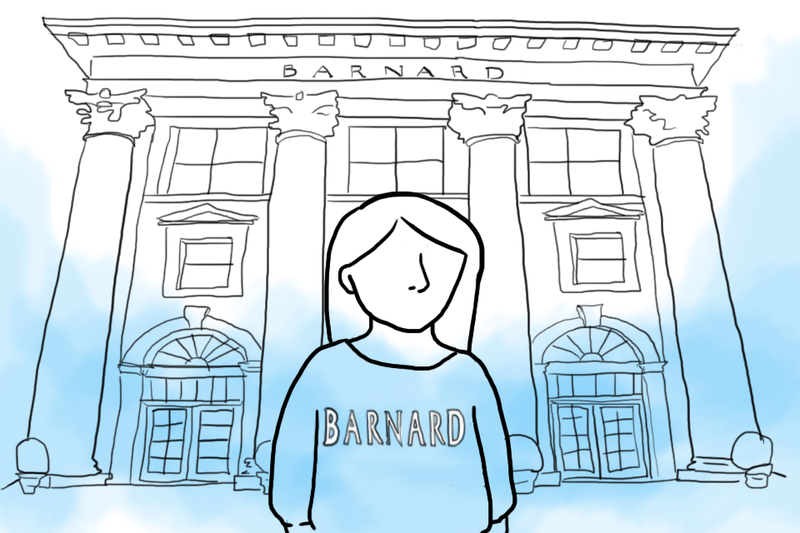 Herein lies one of most looming obstacles a transfer student at Barnard or Columbia faces: a place that celebrates individuality to such a high degree is a place where deep connections are hard to come by. When trying to permeate the social scene, it seemed like half the students spent their time away from campus leading the lives of young cosmopolitans—juggling lofty internships and hitting up their promoters on the weekends––while the other half spent 99.8% of their time in Butler, too consumed by their own intellectualism to make small talk, much less lasting friendships. Between the demanding academics, internships, jobs, and unbounded possibilities in NYC, just hanging out with someone at this school takes a substantial amount of prioritization and planning. It has taken me almost three semesters to feel like I have truly found my footing here and a solid group of people I can lean on. I’ve learned the process of establishing relationships is not easy, but it is fruitful. The friends that I’ve made are a product of mutual love, trust, and admiration, rather than proximity. I didn’t anticipate it would take so long to grow a web of connections at this school, but in hindsight I needed it. Struggling to find pockets of belonging at Barnard forced me to confront parts of myself that had long been subdued. Until then, I defined myself largely by external factors like the people I surrounded myself with or the groups I was a part of. Although there were and will continue to be lonely parts about being a transfer student, I have a newfound sense of perspective and confidence because of the challenges I’ve faced due to my refusal to settle. I risked what was familiar for what was uncertain—and I got to know more about who I am in the process. I am not afraid of change because I have done it before. I’m not ashamed to stand on my own because I am comfortable with myself. And I am not embarrassed of being “different” because I have a sense of identity separate from my surroundings. In fact, Barnard has taught me to celebrate it. The author is a junior at Barnard studying psychology. You can find her breathing deeply at the back of Yoga to The People sessions on 103rd Street or shamelessly dancing to her headphones on the subway. This op-ed is part of a Scope on the experiences of transfer students. To respond to this op-ed, or to submit an op-ed, contact opinion@columbiaspectator.com.